Businesses that offer employee perks help their workers create work-life balance, learn career skills, and take control of their schedules. We explain why employees value their perks, as well as the importance of flexible scheduling and professional development. Employee perks are one of the most important practices a company can implement. Whether those perks come in the form of a free snack bar, the option to work from home, company retreats, or reduced-rate evening classes, employee perks show workers that businesses care about their wellbeing. Lately, companies like REI, Salesforce, Twitter, and Evernote have made headlines for offering perks like paid volunteer time, free cooking classes, and three catered meals a day. However, businesses with fewer resources can still offer budget-friendly employee perks that make a big impact. We surveyed 507 full-time employees and found that perks increase workers’ efficiency, decrease turnover, and improve company culture overall. Companies of all sizes should look into ways that they can support their employees both inside and outside of work. Over two-fifths (42%) of full-time employees have no employee perks at all. 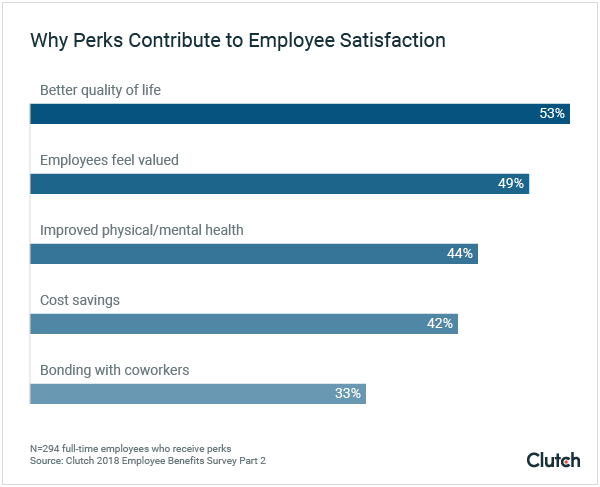 More than half (53%) of those who do have employee perks say that those perks give them a better quality of life, meaning that employees value their perks. 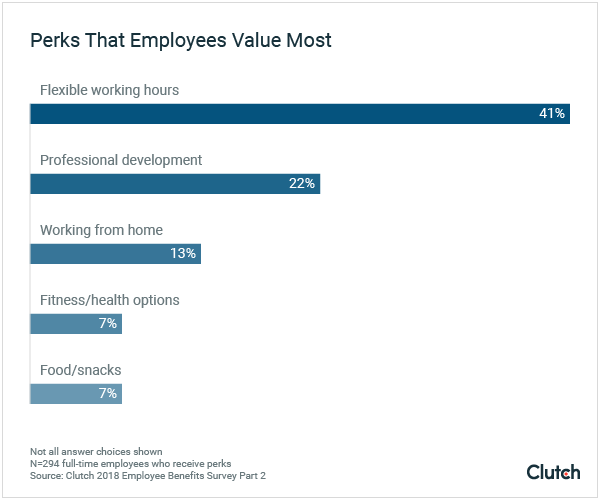 Nearly a third (32%) of employees have flexible hours, and 41% of those with perks say that flexible hours are the most important perk they receive, suggesting that flexible scheduling is a top employee priority. Over 25% of full-time employees have paid professional development. Over 66% of employees who receive perks are satisfied with them. Employee benefits come in two varieties: traditional and perks. Traditional benefits typically have an associated dollar amount, whereas employee perks are tied more closely to lifestyle quality than to money. Traditional benefits include health insurance, retirement savings options, life insurance, and paid vacation time. For more information on this topic, read our survey on the importance of traditional benefits. However, almost anything can be an employee perk, said Lisa Oyler, human resources director at Access Development, a private discount network popular with employers. For example, Infusionsoft’s display of breakfast cereal, which it provides to all its employees, is a perk. 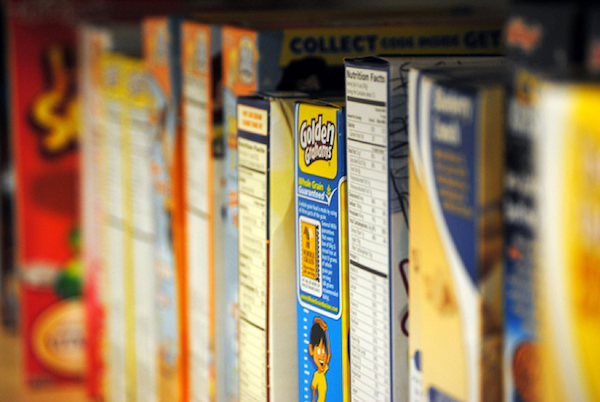 Cereal is a small gesture, but it's the kind of thing employees notice and appreciate. Ultimately, perks like these help make the workplace an inviting environment stocked with resources. Businesses that offer employee perks have a stronger relationship with their employees, as workers feel supported both in the office and outside of it. Yet, more than 2 out of every 5 businesses don’t offer any employee perks. The absence of employee perks can significantly impact workers. Employee perks are essential to a thriving workplace in which employees see themselves as fulfilled both inside and outside the office. Lisa Oyler said that these benefits lead to greater work-life balance, employee retention, and productivity. Of those employees that have access to perks, flexible working hours are the most common employee perk, at 32%. 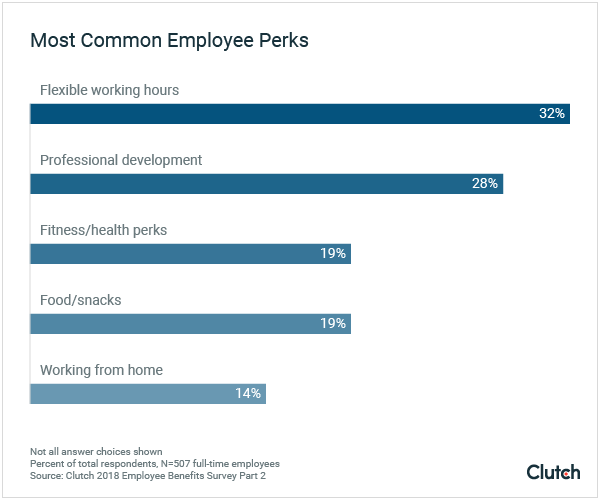 Other common perks include paid professional development (28%), fitness and health opportunities (19%), and on-site meals (19%). Through these nontraditional benefits, Oyler noted, businesses attract and keep people because employees are encouraged to thrive. We spoke with several employees in various industries about their employee perks, and their thoughts support Oyler’s argument. “The culture and benefits are really good where I work,” said a manager at the Virginian branch of an international shipping company. These benefits shape how this employee views a fulfilling workplace. An employee at a biomedical research facility in Virginia feels the same way. Through her job, she has access to low-cost food, book clubs, a shuttle to work, movie showings, and a women’s coding group. Several months ago, another company offered her a job, but she didn’t take it. “These perks increase my job satisfaction,” she said. Plus, her company has on-site daycare for her young son, so she doesn’t have to worry about school carpool. “I would turn down any job offer because of this perk,” she noted. "I would turn down any job offer because of my perks." These two employees’ experiences demonstrate how crucial perks are to employees’ satisfaction. The majority of workers who receive employee perks say that these benefits improve their lives. Over half (53%) of employees say that perks give them a better quality of life. In addition, nearly half (49%) say that receiving these benefits means they know that their employers are invested in them as individuals. No matter a company’s size, there are ways to give back to employees. It might seem difficult for small businesses to offer benefits like on-site meals and gym memberships. However, smaller companies can be flexible with the perks they offer. Opportunities like company retreats are expensive and can be replaced by in-office meetings, said Courtney Berg, president of HR consulting firm CourtSide Consulting. Instead, Berg advises, focus on the crucial benefits, such as professional development. For some businesses, especially those in STEM fields, professional development is essential. Employees need to know the newest techniques in their industry to stay relevant, whether that’s a coding language or a teaching method. Health and wellness programs are a low-cost way for businesses to show employees that they’re invested in their workers’ health. “Try offering perks like wellness credits or gym membership,” suggested Mary Pharris, director of business development and partnerships for Fairygodboss, a reviews website that provides information for women in the workforce. The business covers the entire cost by prepaying discounted memberships. The business covers a percentage of the membership, and the employees cover the rest. The employees pay for discounted memberships, which can come out of their paychecks so that the payments are pre-tax. Small businesses with a lean operating model can pick the last option, which allows a business to support workers without paying extravagantly. These kinds of perks may seem minor, but they matter, said June Palmer, director of sales at VIDA Fitness. Flexible working hours are the most popular employee benefit and are becoming increasingly important to a workforce whose members prefer to set their own schedule. The term “flexible working hours” refers to the practice of allowing individual employees to decide when they begin and end work. Businesses might let workers come in any time from 8:00 to 10:00 and leave from 4:00 to 6:00, or they could let employees work extra hours Monday through Thursday to take Friday off. Over 40% of workers say that flexible working hours make more of an impact on their satisfaction than any other employee perk. In addition, the third most impactful benefit, at 13%, is working from home. Our findings about employee priorities fit the larger narrative about flexible working hours – they make workers happier and, in turn, more productive. That’s why employees place such value on setting their own hours. That’s why businesses should consider a flexible work program, said Lisa Oyler. “We have people who create their own schedules according to their lifestyles and needs." As long as employees come in and do their work in a timely and effective way, Oyler said, they can decide when to come in. Women value flexible working hours more. This is likely because flexible schedules allow parents, especially working mothers, to better care for their children. More women (15%) than men (11%) say that working from home is their top employee perk. In addition, a slightly higher percentage of women rank flexible hours as their top perk (43% of women vs. 40% of men). That difference in priorities, said Mary Pharris, is because child-rearing responsibilities still fall more to women than to men. This need for flexible scheduling will only increase in the future. “You’re seeing more and more employers offer it because working parents are demanding it,” said Pharris. Allowing working mothers to care for their children means that they have a better chance of feeling fulfilled as both parents and as competent employees. They are not required to sacrifice one for the other. Flexible hours and work-from-home policies don’t always benefit companies. In fact, they can sometimes have the opposite effect. Here are three of the greatest downsides to flexible working hours. The greatest downside to flexible working hours and work-from-home policies is the chance that employees will miss the sparks of inspiration that in-person meetings create. “There’s so much collaboration that happens in the office. You have to balance out-of-office work with regular in-office work around the rest of the team,” said Lisa Oyler. That’s why it’s best when employers clearly communicate the kinds of flexible work employees are allowed. If flexible hours are permitted but working from home is not, communicate that. Maybe working from home is only acceptable once a week. If employees know when they can and can’t work from home, they’ll be able to plan in-person meetings. Employers shouldn’t use flexible working hours as an excuse for employees to always be available. In other words, just because employees can work from anywhere doesn’t mean that they always should. For example, a vacation should stay a vacation, even if there’s WiFi available. “Even if you’re working at a beach, you’re still going to get burned out if you’re not taking time for yourself,” Oyler said. Flexible working hours should relieve stress for employees, not add to it. No matter what businesses decide, they should clearly communicate any scheduling changes with employees. Managers may run into trouble if they unilaterally decide to implement, cut, or change flexible work policies without discussion. Take the case of Yahoo. When Marissa Mayer became the company’s CEO in 2013, she banned remote work of any kind in an abrupt memo. Both Yahoo employees and outsiders were upset that Mayer, herself a working mother, cut working from home for all employees. Mayer’s decision attracted months of bad publicity, and maybe as a result, Yahoo’s stance seemed to have softened by 2015. Mayer and Yahoo are an example of how not to implement a flexible work policy. Clear communication and expectation setting, not sudden memos, are the key to making flexible scheduling work. When businesses offer to pay for professional development classes and seminars, employees feel more confident in their work. At 22%, professional development is the second most important perk to workers in terms of their job satisfaction. “Professional development” refers to opportunities workers have to improve their job-related skills. Examples include conferences, webinars, and book clubs that are paid for by the company. Businesses should take note of how highly workers value professional development, especially because professional development has worth for both workers and their employers. A more knowledgeable employee is a more competent one, said Kimmie Champlin, our professional development coordinator at Clutch. “Any good job starts with good training,” Champlin noted. “An employee that’s not trained doesn’t have autonomy over their work. The best professional development not only encourages employee autonomy, Champlin continued, it also plays into employees’ desires. For example, Clutch’s analyst team is currently learning more about inbound sales, both because team members asked for more information on the topic and because management sees a need for inbound sales education. Learning opportunities are possible through online seminars, local conferences, book clubs, and speakers. The fundraising employee's experiences show how well professional development benefits all parties when their learning goals are aligned. Small businesses may leave professional development off their list of priorities, but they shouldn’t. It’s not as difficult for companies to provide access to a Lynda online learning and training course, as it is to provide competitive health insurance, for example. "The modern learning landscape offers so many resources." These inexpensive and/or reusable resources have familiarized Clutch employees with Google AdWords, data-driven storytelling, and fundamental business concepts. Businesses of all sizes should strive to create the kind of company culture that supports workers, and employee perks are a major part of office life. Flexible scheduling (which includes flexible hours and working from home) and professional development are two of the most important perks. However, anything can be a perk, so companies of all sizes should get creative with what they offer. Ultimately, a rising tide lifts all boats, and that’s especially true of employee perks. When workers feel comfortable in all aspects of their lives, they’re more likely to give back to their employer with productivity, ingenuity, and teamwork. Fifty-two percent (52%) of respondents were female, while 48% were male. Respondents were evenly split among age groups: a third (33%) of respondents were 18-34 years old, while another third (34%) were 35-54 years old, and the last third (34%) were 55 or older.